Of course we often associate prayer as becoming a habit, but I was intrigued that this lady added another significant component to prayer just being a habit, it had to be completely encompassed by our attention. As I was thinking through this new conception I had about prayer, I began to take note of my daily personal habits and how many of them I automatically accomplished without giving one thought to what I was doing; e.g. brushing my teeth, drying my hair, making the morning coffee etc. I began to grasp the importance of that word, ATTENTION and the danger of allowing my prayer time to become one sided with me doing all the talking while not paying attention to what my Heavenly Father wants to say to me. 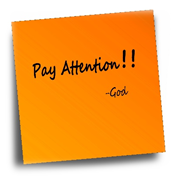 The book of Proverbs has several verses about paying attention to the Father’s words. The other truth I discovered in that short quote was the last phrase, brought to bear on all that is, our attention to the Father’s words has bearing on every aspect of our lives and is not limited to when we call upon him, we need to be attentive to the Holy Spirit’s direction what ever we are doing. Many years ago a dear friend introduced me to the beautiful simplistic prayers of the Celtic Christians. I say simplistic because they grasped how to be attentive to the Lord by including him in those everyday chores they performed. The chores were still habits they did every day, but with deliberately including the Lord they were transformed into being attentive to what he was saying to them. They prayed while lighting the fire, milking the cow, gathering grain. You have made me move. This morning I am reading your words just after waking, and the birds are singing in our garden – all making the verses of the Celtic prayer you quote so apt. Thank you Jo for beginning my day this way. The paying attention part is not always there but thanks Jo for reminding me to do just that.